Fabric 8 here in San Francisco's Mission (22nd & Valencia) is changing their name to Luna Rienne Gallery on their 17th anniversary on January 26th when they host a farewell party featuring a clearance sale of their boutique items and special discounts on original artwork to make room for new inventory. 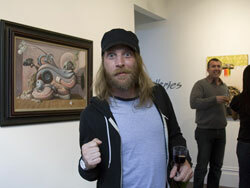 View photos from their group show Classic back in November. Fabric 8 changing name to "Luna Rienne Gallery"
The grand opening of Fabric8's new gallery space in SF. The boutique store recently expanded to an additional two-three rooms, exclusively for the purposes of showing artwork. Ferris emailed some new work. He's doing a live painting at Fabric 8 on Saturday here in SF.